The Uganda safari destination of Kidepo Valley National Park positioned in the Country’s north east boats of being one of the virgin wilderness areas that apparently exist not only in Uganda and Africa but the world at large. Considered as the most distant destination from the country’s capital Kampala, connecting to Kidepo Valley National Park while on a safari in Uganda requires you to cover 700km driving through impressive countryside landscapes of the central Uganda that appear on extended flat stretches than in any other part of the country. The savannah plains of Nakasongora hold the longest stretch of flat road in the whole of Uganda. You drive past Karuma falls where you cross the famous Karuma Bridge to enter in to the northern section of Uganda passing through Gulu, Kitgum and eventually Kidepo. 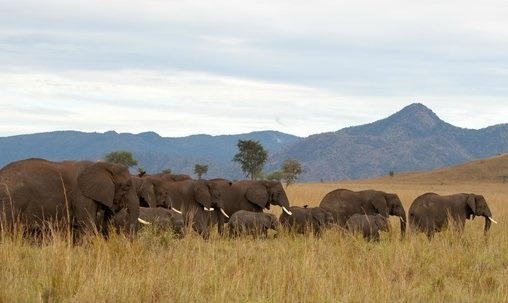 However, its journey tends to be long and travelers on safaris in Uganda tend to opt for a journey break in Kitgum and then connect to the park the following morning. Whatever the option, the long journey to Kidepo is well compensated once you arrive there. You are welcomed by the impressive rolling dry savannah landscapes that are portioned into extended valleys ending into rising hills and mountains that have marked the topography of Karamoja region for centuries past. The famous Narus Valley and the Kidepo Valley after which the park is mentioned are beyond the ordinary. Karamoja being a dry region, the rivers like Kidepo tend to dry during the times of drought and few water points would be traced in the floor of the Narus Valley. This presents a memorable wild game viewing that you can ever have on Uganda safaris and tours. The animals tend to congregate on this water points. Nearly all the grazers namely the elephants, Rothschild giraffes, buffaloes, a range of antelopes among others are seen with in the valley grazing around these water points. In return, the predators like Lions, cheetah, leopard, hyenas and jackals among others have to dwell within the close range to feast on the grazers. A combination of this makes a game drive in the Narus Valley worth undertaking and a reason to visit Kidepo Valley National Park. The extension to the Kidepo Valley does not only expose you to the Kanagorok hot springs and the sandy Kidepo River, it also gives you an opportunity to encounter the only Uganda’s population of Ostriches thriving in their natural habitat. Besides nature, the Kidepo Valley National Park is surrounded by the Karamojong people. These are divided into the indigenous Karimojong and the pastoralist Karimojong. It is such a wonder in this century to encounter one of the authentic cultures that are still living on a world scale despite the waves of globalization. This would form one of the main reasons as to why world travelers should include Kidepo while planning their safaris to Uganda. The pastoralist Karimojong live in Manyatta villages with impressive architecture and homestead setting with all their life centered on their cattle. For the indigenous Karimojong, they thrive in the hilly landscapes of Morungole Mountains and were initially cultivators. The scenic landscapes of Mount Morungole, Lomej Hills and Namamukweny valley not forgetting the overlooking south Sudan Mountains combine to make your visit to Kidepo memorable.